A superior deluxe Hotel member of The Leading Hotels of the World and The Concorde Hotels. 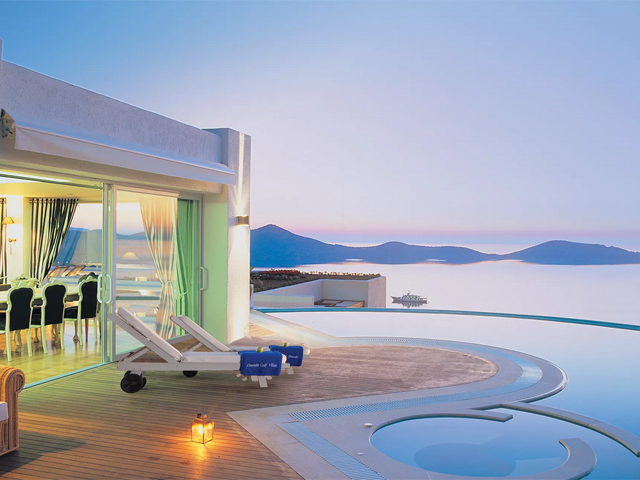 We welcome you to the world of Elounda Beach Hotel & Villas, the ultimate hideaway with luxury guest rooms, villas and suites in Crete, Greece. 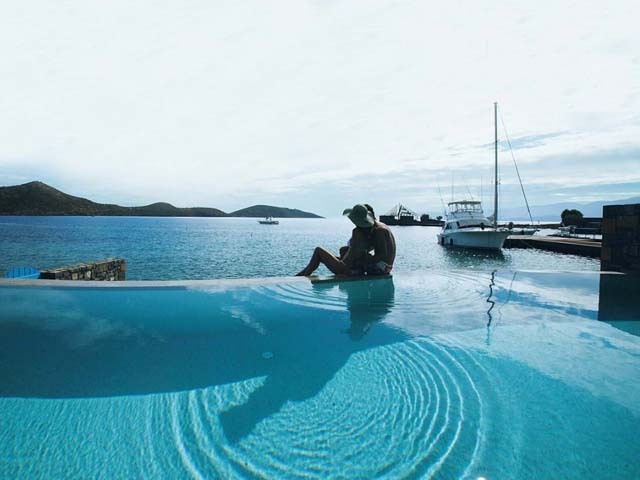 In a unique waterfront location, experience the feeling of relaxing in your own heaven at sea level with outstanding personalised service. 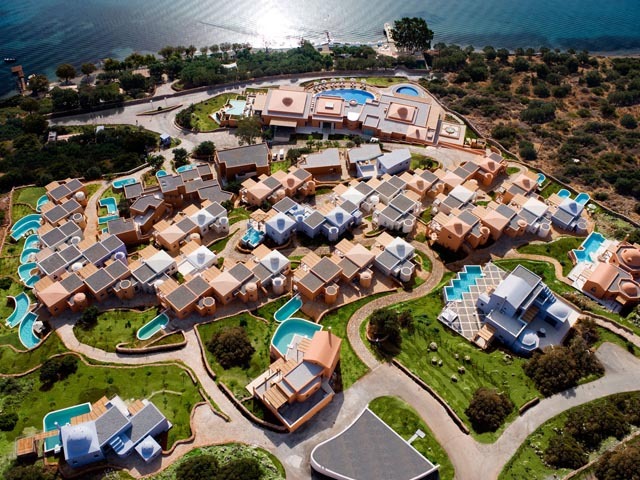 The Elounda Beach Hotel is situated on the North-East Coast of Crete, this exclusive resort offers breathtaking views over the Mirabello Bay. A unique oasis of luxury and excellent taste in 40 acres of colourful gardens combining excellent service, superb suites and award winning cuisine. The ultimate hideaway with luxury guest rooms. Choose among our five accommodation clubs with corresponding features, services and privileges that best satisfy your requests. In Elounda Beach Hotel & Villas we believe that you, our honored guest, deserve the best and we are committed to fulfilling your special requests. Hence, when reserving a room or during your stay just let us know your wish and we will make your dreams come true! Holidays are as much a time to relax as they are an opportunity to try new sports and activities. 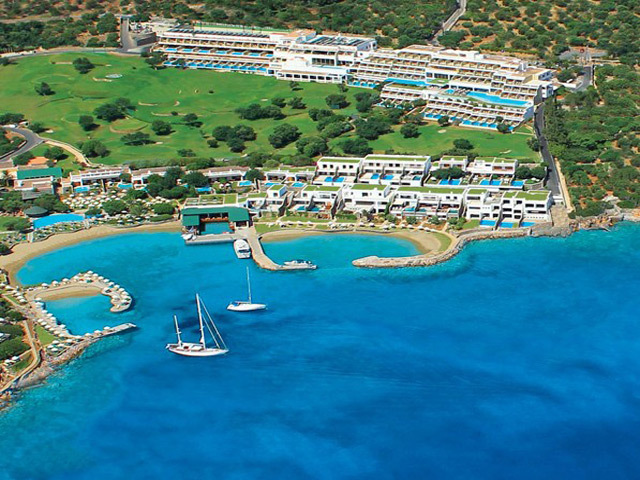 And we do our utmost to ensure that Elounda Beach guests always leave feeling invigorated, fit and happy. Enjoy a wide variety of leisure activities within the hotel giving you the unique opportunity to create your own tailor made holiday experience. Diving center - Ranging from elementary courses to specialized courses, PADI certified. Our junior guests are on holiday too! A dedicated staff on hand to create the holiday experience for all the family. Happy kids, happy family, happy holiday! The Espace Vitalité Chenot offers both holistic rejuvenation and relaxation in a setting of complete tranquillity. You'll relish the personal attention that is part of Chenot's renowned body and face treatments. We have a holistic vision of the body that supports the view of how important it is to invest in both our daily physical and mental health, in order to obtain the optimal health in any age, with an active, complete and satisfying social life. We live in an environment that is continuously changing that may be hostile to our lives. The environmental pollution, consumption of processed and non-organic food, lack of physical activity, stress, and above all, the unhealthy habits and lifestyle, all combined, force the body and the mind to constantly battle to adapt to these environmental conditions. As a result, the body accumulates “toxins” with time, and gradually reduced functions and increased body damage settle in. In our company, we recognise this all, and the bad impact that it imposes to life, particularly when one carries on living in the same way, doing very little to change. We adopt a multidisciplinary therapeutic approach to our method of work, known as the Chenot Method. We have designed personalised powerful and effective treatments, therapies and products with the intention to detoxify the body and the mind, improve the vitality, the spirit and the wellbeing whilst promoting the beauty and aesthetics in the years to live through a strong, healthy body and mind. With over forty years of experience we have developed a unique Method of treatments. We strongly believe that our fully integrated approach, our powerful treatments combined with our guests’ positive attitude towards life and their will power to a healthier lifestyle, will ultimately support them to obtain the optimal health and beauty in any age. The Espace Vitalité Chenot Crete is a wellness centre in which the hotel guests can choose wellbeing and vitality programmes, beauty treatments, fitness and wellness facilities to help them relax, restore and rejuvenate during their period of stay all according to the principles of Biontology. The Wellness Department is dedicated to supporting physical activity and improving the purification, rebalancing and harmonization processes in the body. With the expert advice of a personal trainer, clients are offered suitable programs with the aim to achieve the optimum level of personal fitness. Private lessons with final assessment and advice for carrying out proper training at home too. Emphasizes on your body’s core: the abdomen, obliques, lower back, inner and outer thigh and bottom and develops strength, flexibility, muscular endurance, coordination, balance, and good posture. Aqua Gym is also an excellent way to improve athletic ability by using the water’s natural resistance to build strength and improve muscle tone, with low impact in joints. An effective circuit training program to burn fat and build muscle. A great way to get into top, cardiovascular condition. Stretching is a form of physical exercise to improve the muscle's elasticity and achieve comfortable muscle tone. The swimming lessons serve to develop swimming technique and confidence in the water. These activities are complimentary and available daily at the fitness studio with access to sauna and steam bath. Let us organize your event so you can celebrate your special moments with superb catering and exceptional service. 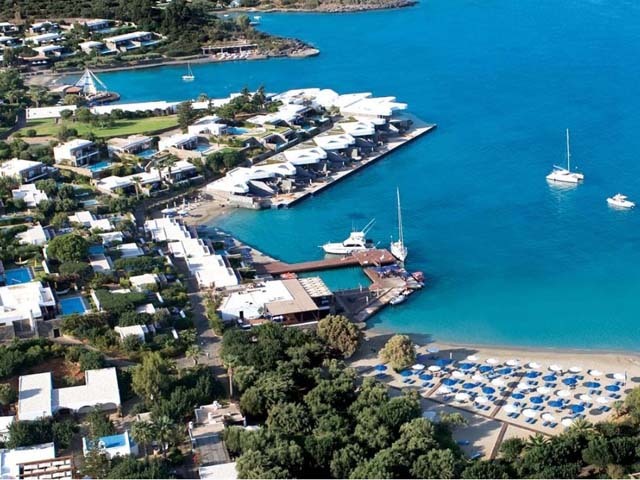 We welcome you to choose from Elounda beach hotel’s variety of venues, large or small, with spectacular views from blue sea to blossoming gardens. The venues can be fully equipped with all requirements to ensure that all your requests are fully satisfied. Indulge yourself in Elounda Beach Restaurants & Lounges and discover a fascinating world of fine dining. Combining contemporary elegance with unique scenery and unparalleled service, Elounda Beach offers an unforgettable culinary journey from Mediterranean to Asian flavors. Choose from seven restaurants and their exciting cuisine and let us spoil you with a fusion of flavors that will delight your senses. Named after the hedonistic God of Wine, Dionysos more than lives up to its promise of indulging all the senses with exquisite cuisine and a legendary wine cellar. This outstanding establishment offers a superb blend of Mediterranean gastronomy with contemporary influences served in an understated, exclusive atmosphere. Indulge yourself with the Argonaut's healthy, enticing Mediterranean snacks during the luncheon hours. Evenings, the seaside restaurant lures you back again with its mouth-watering variety of fragrant Italian dishes, prepared to perfection by our team of Italian chefs. The New Gastronomic concept Mistura, in Elounda Beach Hotel, by the Chef Dimitris Katrivesis is the idea that condenses the essence of Peru. A reflection of their people and the country’s cuisine with a multicultural of Japanese, Spanish, Chinese & Italian influence, blending these marvellous mixtures with its native pre Columbian and Incas gastronomic heritage. Our Mistura is a modern and dynamic restaurant, celebrating the bio diversity of the island, a true homage to the Peruvian multicultural diversity and the Greek culture, by proposing savors that are once familiar yet adventurous and unexpected. 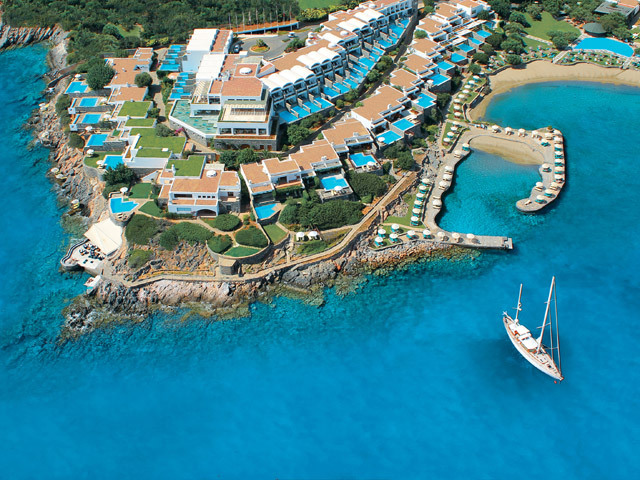 Here you will sample the irresistible and nutritious delights of world-renowned Cretan cuisine. Pure, simple homemade-style dishes are served in the rustic, laid-back setting of a traditional Greek village square, shaded by olive trees. 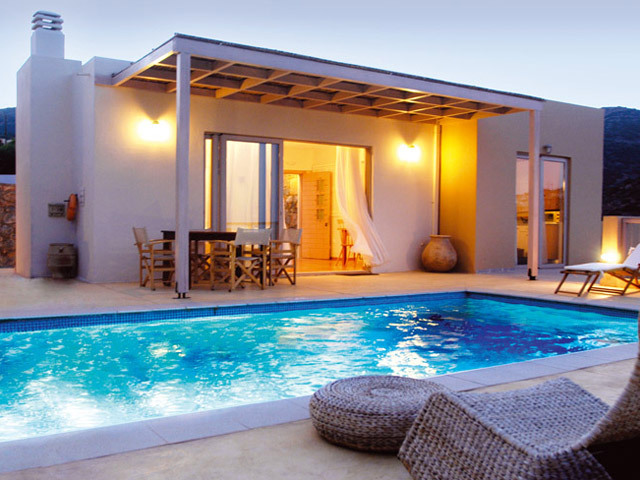 Best of all, the Kafenion is but a stone's throw from the beach. 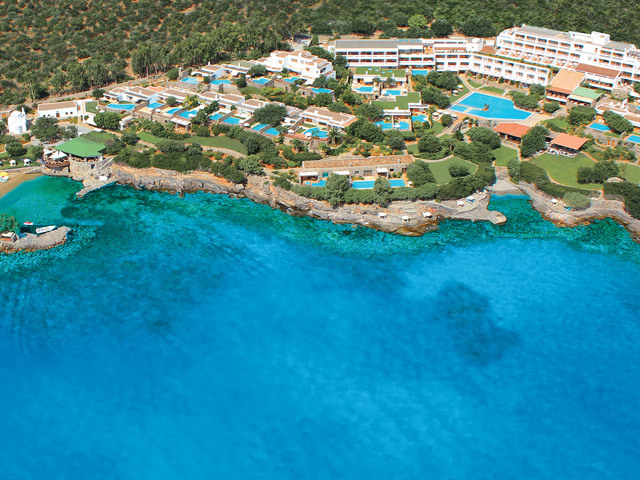 Let your senses run wild next to the shimmering crystal blue of the Artemis's pool waters and surrounding gardens. Delicate breezes from a profusion of colorful flowers will soothe your soul as you enjoy an exciting American breakfast. A concept restaurant and Shisha lounge, propose a modern and revised version of the Home made food. You don’t need to order and the menu consists of four courses on four recipes, daily changed, while served in pottery miniatures and verrines. A perfect place to unwind on the sofa, enjoying your meal and surrounded by the best chill out music and the stunning views over the lighted pool and gardens under the stars. Whether it’s a breakfast, lunch, an intimate dinner or a late-night bite, our in-room dining offers the ultimate experience in the privacy and comfort of your own guest room or suite. We offer an extensive in-room dining menu from the culinary team of the Elounda Beach Hotel with a personalised service for an unforgettable meal. Our expert team will also offer a range of decoration & design ideas to ensure that your in-room dining will be truly exceptional and incomparable. Awarded with the distinction “Best of Award of Excellence” by Wine Spectator magazine, our wine list comprises 1.100 labels. Sample our extensive selection of wines from around Greece and the world, many of which you may not have yet encountered. Our cellar is home to several exclusive labels. We host frequent wine tasting events that will excite your senses. Our sommeliers will recommend the wine that will best complement your fine dining experience. 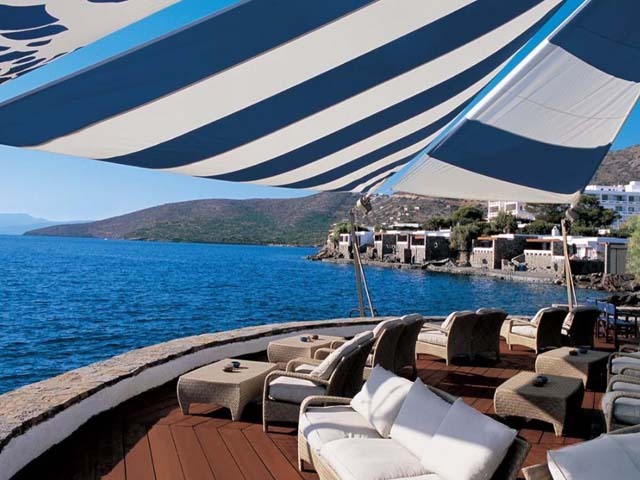 Any time of the day, treat yourself with a refreshing cocktail in the relaxing atmosphere of the Elounda Beach lounges. Sitting at the bar, surrounded by sea, conjures a feeling of being on a glamorous private islet. Soothing atmospheric music, cocktails ranging from exotic to classic and a lively, friendly staff make Veghera the ideal spot to enjoy a pre-dinner cocktail at sunset, or after-dinner drinks that might just continue into the early hours. The Lito is the place to unwind and harmonize with your surroundings, along with live piano or harp music filling the air. Enjoy afternoon refreshments or savour evening drinks over a relaxed chat. Open until late into the night. Located next to the pool and named after the Greek word for 'fairy' for its light, dreamy design, Neraida serves a wide variety of fresh local and tropical fruit juices, sophisticated cocktails and fine wines. Located next to the Water Sports Club, this easy-going and accessible beach bar is perfect for a quick and tasty daytime snack or refreshing drink.